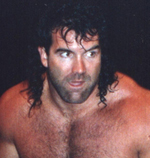 Former TNA wrestler Scott Hall is currently in WWE-sponsored rehab, according to close friend Kevin Nash. Nash confirmed on Twitter this morning that Hall "is under care in the WWE's Wellness program." Since being released by TNA in June, Hall has been in and out of the hospital after coming down with double pneumonia affecting both lungs. Hall was scratched from an East Coast tour August 20-26, including a big independent show in New York City on Aug. 20. Hall's publicist said in a press release last week, "Recovery for Scott has been very slow process; he was trying to get better and was looking forward to his appearances on the East Coast."